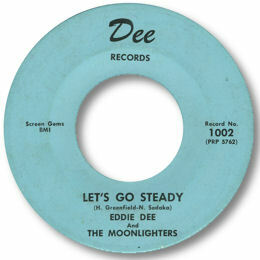 No doubt Brill Building writers Neil Sedaka and Howard Greenfield penned Let's Go Steady as a piece of teen pop but by taking it and placing it in a Southern Soul setting Eddie Dee has turned it into something more substantial and enduring. Within a fine arrangement of rhythm and horns Eddie has added his own gospel drenched vocal and created a first class deep soul disc. The key-change chord at the finish rounds it off beautifully. Otis’ original of “Sweet Lorene” was issued in 1966 on the "Dictionary Of Soul” LP so this 45 on what surely must have been his own label was probably recorded soon after that. The flip to the Dunbar is pop. Many thanks to Ralph Barton for the suggestion and the Dunbar info, and to Kevin K for the important amendment.